To end our 2012 advent calendar, we have the second of our 740,000 posters. We’d like to wish everyone a happy holiday – whatever you do at this time of year! We’ll be back in 2013 with more news, new projects and more science based on your work. The Universe is too big to explore without you. A very Merry Christmas to all who celebrate it. Part of Jesus’s life was bringing people together. 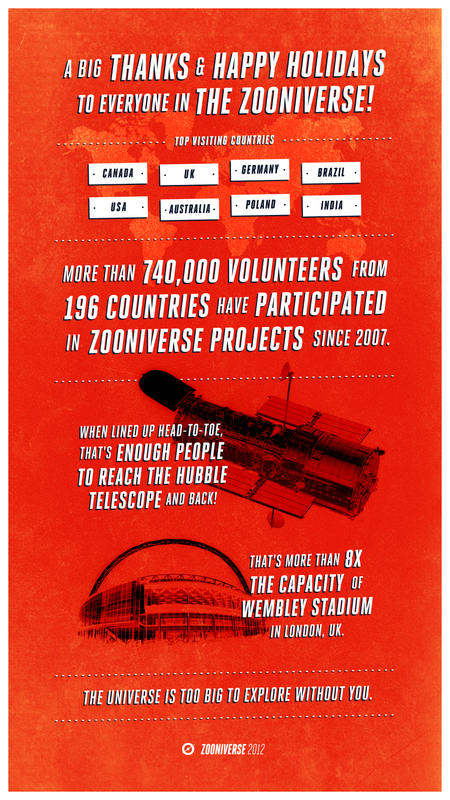 In something of that spirit, I wanted to make note of this poster from the Zooniverse that shows that people from 196 countries are participating in various citizen science projects. I think it’s great that people from so many countries can agree that science is cool and worth participating in. While 740,000 is a microscopic piece of the world’s population, perhaps it is a sign of a coming world where we stop obsessing so much on what divides us and focus on what unites us, like curiosity and an urge to work together on tasks of discovery.